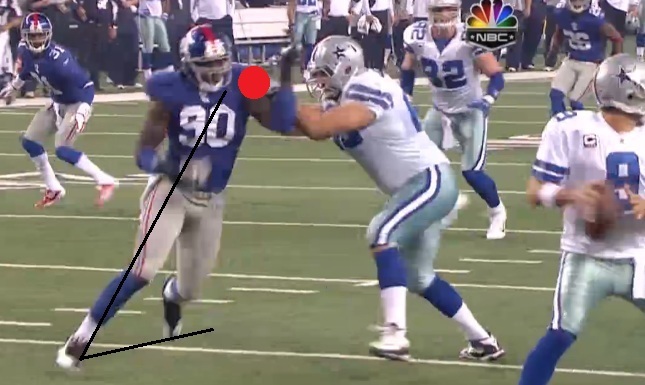 A good template for any aspiring, 4-3 NFL defensive end is Jason Pierre-Paul. Jene Bramel breaks it down as well as anyone. Photo by Mike Morbeck. Editor’s Note: Dr. Jene Bramel is a staff writer at Footballguys.com where he is among the best in the fantasy football business analyzing individual defensive players and player injuries. His top-notch work includes the columns “Reading the Defense,” “Second Opinion,” and his popular segments on The Audible podcasts. 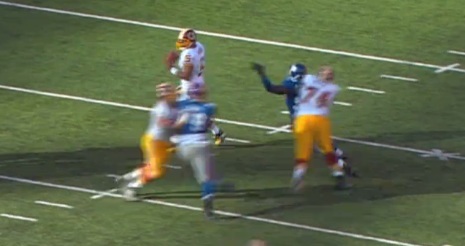 You can find more of his analysis of Quinton Coples against the run and the pass. Follow Jene on Twitter @JeneBramel. When asked at the Senior Bowl to compare his playing style to that of any current NFL defensive lineman, Quinton Coples chose Jason Pierre-Paul – the latest in a recent line of talented New York Giants’ defensive ends. The comparison isn’t unreasonable. Both players are long and athletic and capable of stretches of dominant play. At times, when he uses his refined and preferred inside swim move or is able to get under his opponent’s pads and set a strong edge against the run, Coples’ play resembles that of Pierre-Paul. Unlike Coples, Pierre-Paul has learned to play with a consistent pad level on every snap. In my last post, I highlighted two plays in which Coples quickly and cleanly beat the tackle off the ball but fail to finish the play due to poor technique. In this post, I’ll contrast Coples’ sloppy pad level, footwork and pass rush angles with those of the technically sound Pierre-Paul. 2011 was Pierre-Paul’s breakout season, but he was already making the transition from athletic pass rusher to a technically explosive all-around defensive end in late 2010. 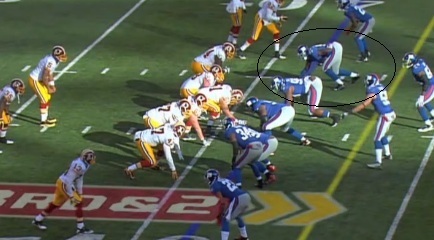 The following series of images are taken from this video replay http://www.nfl.com/videos/nfl-fantasy/09000d5d81ca6534/Giants-defense-sack-4-yd-loss of a December 2010 sack of Donovan McNabb. Pierre-Paul, like Coples, gets into a good coiled stance before the snap. But the similarities end there. 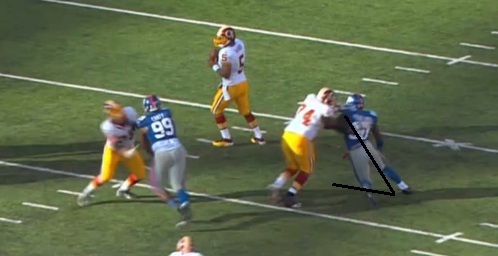 Unlike Coples, Pierre-Paul stays low through contact with the offensive tackle. 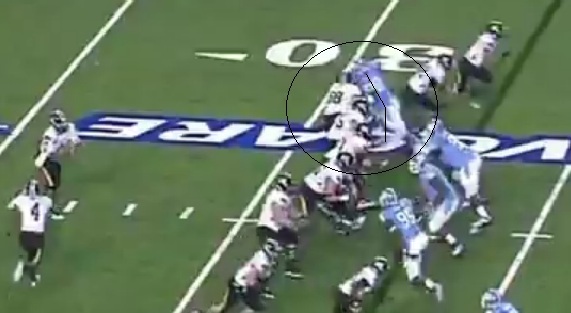 And instead of driving up field vertically parallel to the pocket, he begins to drive at an angle toward the passer. In contrast to the wide target that Coples gave the offensive lineman he’d beaten off the ball, Pierre-Paul shows only the top of his inside shoulder. Pierre-Paul’s good technique and pad level allows him to plant his outside foot quickly and get into a body angle that generates the lean he needs to close on the pocket fast. The body in technically sound action is like a chain, it’s only as strong as its weakest link. If the pad level is strong it sets the foundation for everything else to function well. 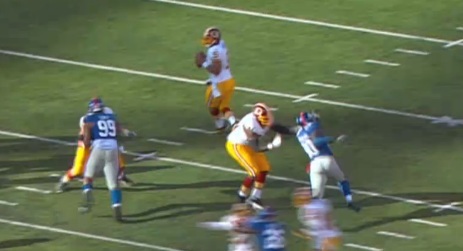 A step and a half later, Pierre-Paul dips under the offensive tackle and flattens his route to the passer. Unlike Coples, who needed extra steps to complete his path after getting too high through contact, Pierre-Paul now has all his momentum moving horizontally. 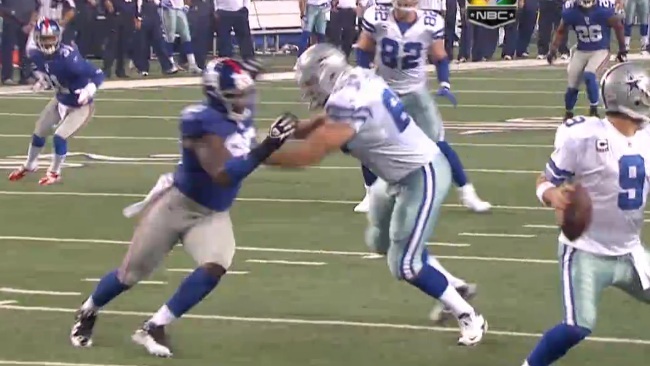 The Giants defensive end remains just as explosive exiting his lean as he was entering it. The photo below is another angle of Pierre-Paul’s pad level, which is well under that of his opponent. 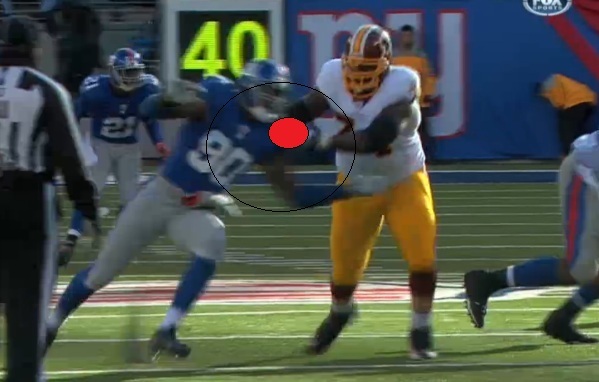 Note the much smaller target Pierre-Paul gives his opponent compared to the photos of Coples in this situation. In contrast, Coples is nearly vertical in his position and at the same point in the pass rush he had shown most of his back to the offensive tackle. 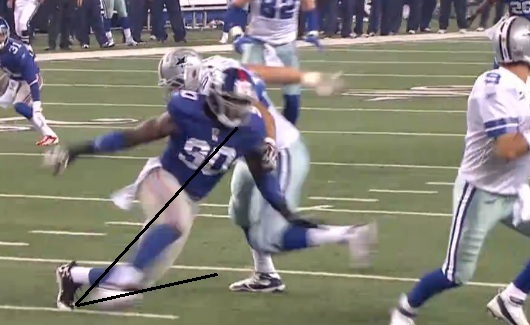 Running backs will tell you that football is a game of inches, but for a defensive end its a game of angles. 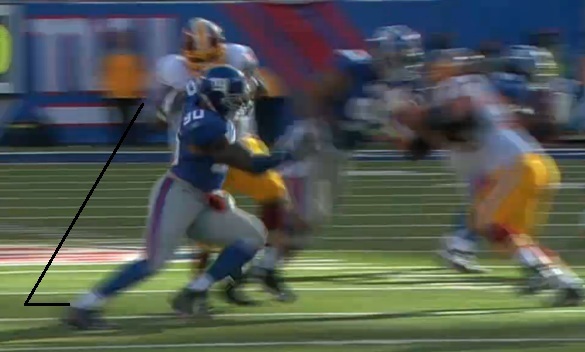 Look at the power and explosiveness that Pierre-Paul generates as he flattens his angle to the pocket. Pierre-Paul’s technique helps him generate power that is too fast for HD film to avoid making the DE a human blur. I used the same title as a lead-in to my second series of images showing the lapses in Coples’ edge rushing technique in Part 2 of this series, arguing that the extra two to three steps Coples lost in reaching the quarterback on a play that ended in a complete pass were possibly the difference between a late quarterback pressure and a blind side sack. As he did in the first example, Pierre-Paul uses his explosiveness off the ball to win the leverage battle at the moment he engages the offensive tackle. His arms are extended and his pads are lower than his opponent. Again, in contrast to Coples, he’s already begun to flatten his pass rush angle, moving horizontally as much as vertically. Pierre-Paul once again plants his outside foot and presents an ever-vanishing target to the offensive tackle he beat with his first initial steps. The former University of South Florida phenom now rips underneath the opponent’s pads while decisively flattening his angle around the corner. There are no wasted steps in Pierre-Paul’s lean as he transitions all of his momentum to the horizontal plane, which helps him preserve all the power he’s stored in his lower body after driving from his coiled stance. I’m not sure if there is a succinct word or phrase for this, so I would like to coin the term… I would like to refer to the space between a DEs coil and the pass blockers set stance as the “Bramel,” or, the ability of a player to move quickly and efficiently through the Bramel has a high correlation to how effectively a defender can get an angle to the QB using various moves. This angle Pierre-Paul takes is one that only the most technically proficient pass rushers can generate – guys like Jared Allen and DeMarcus Ware. 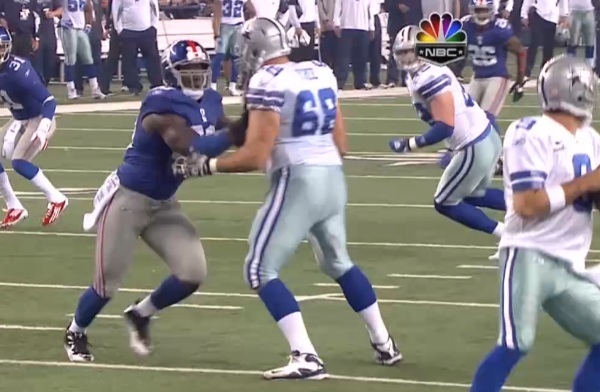 Pierre-Paul’s pad level and lean is so good that his inside knee is nearly scraping the ground as he drives toward quarterback Tony Romo.From another angle, Pierre-Paul demonstrates how great technique and elite athleticism are combined to generate explosive plays that can demoralize an offense. Instead of giving Tony Romo that extra split-second to throw the ball away, Pierre-Paul covers hash to hash in just one vertical yard, forcing a fumble that results in a safety. I think Coples is athletic enough to make the adjustments in technique that Pierre-Paul has made. If he does and his body can generate the explosiveness out of that lean that Pierre-Paul has shown, he’ll add a third dynamic component to his array of pass rush moves. That alone may be enough to earn him mentions alongside Pierre-Paul as one of the league’s best young defensive ends. If he makes the necessary adjustments to his pad level and learns to set the edge effectively against the run, Coples can become a perennial All-Pro.